There are two versions of Gravity Wins: a free, ad-supported version, and a paid, ad-free version. The game is identical on both, so as long as you don't mind an ad at the bottom of your screen whilst you're playing, you can save yourself a buck. In case you were seriously deprived as a child and never got the chance to play Connect Four, the rules are really simple. All you have to do is drop your tokens in a way that makes a sequence of four in a row, be it vertically, horizontally or diagonally. You take turns in moving with the person that you're playing, and whoever gets four in a row first wins. Simple, right? In Gravity Wins, however, things are mixed up a little bit. And by 'things', I mean the board. 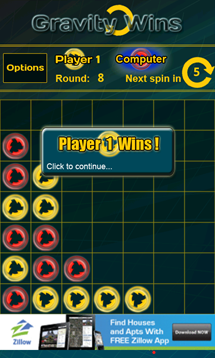 You see, after a certain number of turns - usually four or five - the entire board will rotate itself 90 degrees, causing all of the tokens that are already in place to drop to the bottom of the board. 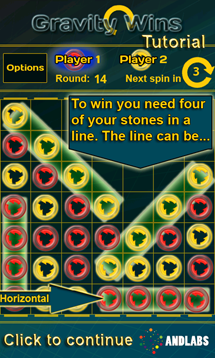 The game has been programmed so that the board won't rotate for the same player twice in a row, which is why the number of turns between each rotation sometimes varies. 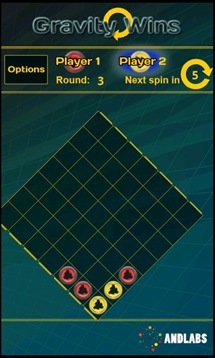 You can see how many turns remain until the next time the board rotates, though, so if you want to be ahead of the game then you can predict where the pieces will fall after the rotation has occurred. It definitely adds an extra dimension to an otherwise old game, and keeps you on your toes more than the board game would do. 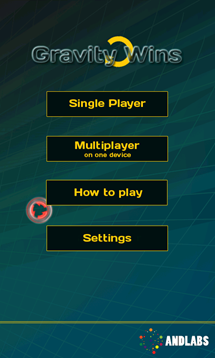 At the main menu of the game, you can choose from either single player or multiplayer mode. When playing single player, you're pitted against the computer. 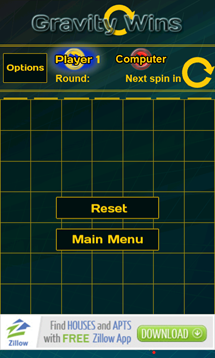 To drop a token, you can simply tap on the column in which you want it to land, and the computer will immediately drop its token as well. When playing the game, I found the artificial intelligence to be fairly impressive, beating me at the first two games. After you get the hang of things, however, it becomes a little easier to beat the computer time and time again. 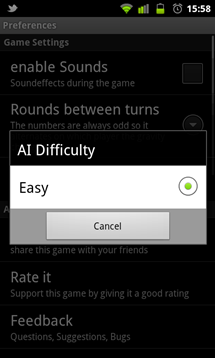 At the moment there is only one difficulty setting for the computer, and that is 'Easy'. Hopefully, there will be more difficulty options coming in the future, as the game gets fairly boring as it is. There is also a multiplayer option available in the app, but at the moment it's for one device only. The developers have said that they are currently working on a multiplayer version that will let you compete against people from around the world, so hopefully that will land in an update sooner rather than later as it will definitely add an extra edge to the game. It would be cool to have a worldwide leader board and a tally of all the matches that people have won or lost as well, to see how you stack up against other people playing the same game. In addition to this, the in-game 'Options' button doesn't really offer any options at all, just 'Reset' and 'Main Menu', so it would be nice to see some more game specific options included here without having to go back to the main menu first. Also, once a game finishes, a little badge appears saying "Click to continue", which is the most infuriating label you could possibly see on a touch screen device.